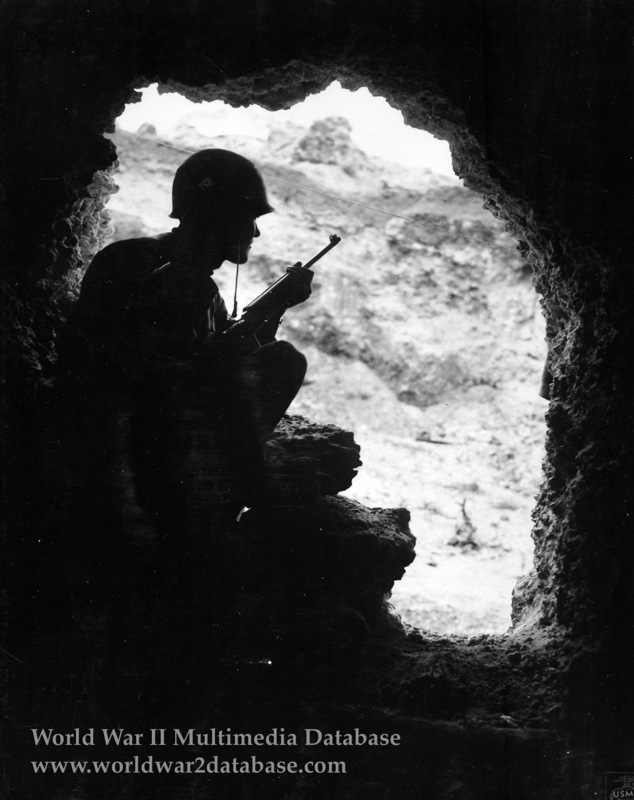 American Marine uses an M1 Carbine to snipe at Japanese positions from an Okinawan cave. The American 10th Army's Action Report for the battle of Okinawa paid this understated compliment to the 32nd Army's defensive efforts: "The continued development and improvement of cave warfare was the most outstanding feature of the enemy's tactics on Okinawa." In their decision to defend the Shuri highlands across the southern neck of the island, General Ushijima and his staff had selected the terrain that would best dominate two of the island's strategic features: the port of Naha to the west, and the sheltered anchorage of Nakagusuku Bay (later Buckner Bay) to the east. As a consequence, the Americans would have to force their way into Ushijima's preregistered killing zones to achieve their primary objectives. Everything about the terrain favored the defenders. The convoluted topography of ridges, draws, and escarpments served to compartment the battlefield into scores of small firefights, while the general absence of dense vegetation permitted the defenders full observation and interlocking supporting fires from intermediate strongpoints. As at Iwo Jima, the Japanese Army fought largely from underground positions to offset American dominance in supporting arms. And even in the more accessible terrain, the Japanese took advantage of the thousands of concrete, lyre-shaped Okinawan tombs to provide combat outposts. There were blind spots in the defenses, to be sure, but finding and exploiting them took the Americans an inordinate amount of time and cost them dearly. The bitterest fighting of the campaign took place within an extremely compressed battlefield. The linear distance from Yonabaru on the east coast to the bridge over the Asa River above Naha on the opposite side of the island is barely 9,000 yards (8.2 kilometers). General Buckner initially pushed south with two Army divisions abreast. By 8 May he had doubled this commitment: two Army divisions of the XXIV Corps on the east, two Marine divisions of III Amphibious Corps on the west. Yet each division would fight its own desperate, costly battles against disciplined Japanese soldiers defending elaborately fortified terrain features. There was no easy route south.